“All interlocutors agree that religious communities, in particular Muslims and Christians, live peacefully and harmoniously side-by-side,” he said. Bielefeldt added that while ethnic, regional and other differences –real or imagined– became factors of political fragmentation and violent escalation, religion was never drawn into Sierra Leone’s conflict that lasted from 1991 to 2002. “The unusual degree of interreligious tolerance and cooperation remains a great asset for developing the nation,” advised Bielefeldt. Since that visit, an anecdote Bielefeldt shared has been widely used to describe religious tolerance in Sierra Leone: A Christian person said that when church is overcrowded he might well decide to go to a mosque to pray. Without a doubt, Bielefeldt’s report brought pride to every Sierra Leonean heart. From Lake Sonfon to the hills of the Sula Mountains, and across the plains of Bo, from Makeni down to Moyamba, and Freetown to Kenema, Sierra Leoneans everywhere stood with Bielefeldt when he told the world that “religious pluralism in Sierra Leone is a dynamic pluralism." If we were ever in doubt diversity in Sierra Leone is cherished as an asset on which to build community life from the local to the national level, Sierra Leone’s partnership with the UN Human Rights Council revealed our age old religious tolerance in a new way. And nothing proved that more than the scores of newspaper articles that appeared after showing just how much Bielefeldt’s observations about freedom of religion or belief in Sierra Leone had rallied us all around something in which we triumph: Sierra Leone is a multi-faith country. Small wonder our governments since 1961 have avoided promoting one faith group within a religion over another, or one religion over another, or religion over secular beliefs or secular beliefs over religion. Over the last six months, new and old conversations about Sierra Leone have made headline news. Recently, the Economist Intelligence Unit (EIU), a source of information on business developments, economic and political trends, government regulations and corporate practice worldwide, presented a report containing conclusions on Sierra Leone’s outlook for 2014-15. Some of the EIU's key expectations include Sierra Leone's fiscal deficit―expected to widen from an estimated 2.7 percent of GDP in 2013 to 3.5 percent of GDP in 2015―the mining sector, public investment, economic growth, living standards, and of course press freedom and political stability. As if in response to his critics, President Koroma reiterated his two-term vision in a New Year meet with his cabinet, Members of Parliament, the chief justice, mayors and chairpersons of local councils. 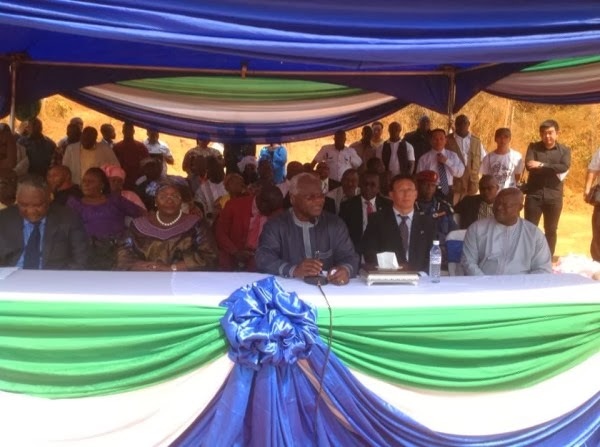 Earlier in January, President Koroma gave examples of how Sierra Leone was making progress. In Port Loko District, the president said, a reliable source of electricity returned after 18 years in big towns like Lungi, best known for being home to the Lungi International Airport that serves Sierra Leone. In Lunsar (the largest city in Port Loko) the president pointed to electrification which he said was about 80 percent complete; and he spoke glowingly of the Bankasoka Mini Hydro which he said has been expanded to ensure the facility is available in nearby villages. The president also announced that work on the new airport at Mamamah will start in 2014 and construction will be accompanied by infrastructure for an "airport city” experts say will take four years to complete. Lokomasama/Kaffu Bullom chiefdoms, long known as the gateway to the country, will be transformed to the "Singapore" of Sierra Leone, he said proudly. Lee Kuan Yew, the first prime minister of the Republic of Singapore, governing for three decades and also widely recognized as the founding father of modern Singapore, recounted Singapore's unforgettable history in The Singapore Story, which he traced from British colonial rule through Japanese occupation in World War II, Communist insurrection, riots, independence ― and the struggles that followed. In the 1970s, Singapore was primarily exporting textiles, garments, and basic electronics, says Ping Zhou, an adjunct instructor and tourism event organizer in the Department of Geography and Geology at Eastern Michigan University. By the 1990s, Singapore was engaging in wafer fabrication, logistics, biotech research, pharmaceuticals, integrated circuit design, and aerospace engineering. As foreign investment poured in, Zhou explains further, Singapore began focusing on developing its human resources, in addition to its infrastructure. "The country set up technical schools and paid international corporations to train their unskilled workers in information technology, petrochemicals, and electronics. For those who could not get industrial jobs, the government enrolled them in labor intensive un-tradable services, such as tourism and transportation. The strategy of having multinationals educate their workforce paid great dividends for the country." he said. Writing for DVV International, which has been training adult educators in Sierra Leone for 25 years, Agnes Pessima observed how Sierra Leone’s war disrupted education. "Despite government efforts, 35 percent of school-aged children were still out of school in 2005," she said. "Some never had the opportunity to enroll in formal education because they were born during the war period. All of these have swelled the number of illiterates in the country." Being out of school, they were engaged in diverse activities for income generation, said Pessima, a lecturer in the Institute of Adult Education and Extra-mural Studies, Fourah Bay College, University of Sierra Leone. "These were generally unskilled jobs such as washing cars, carrying people's luggage, selling fruit or cold water, or working as houseboys. The rest were traders selling assorted items: kitchen utensils, confectionery etc. The cost of items sold ranged from Le100.00 to Le5, 000.00, and profits varied from Le500, 00 to Le20, 000.00. The older ones used the profits to maintain themselves. There were also a few with occupational skills, for example, cobbler, driver, gara tie dyer." Pessima says they concentrated in areas such as Eastern Police, Shell Lorry Park, Bombay Street and Dan Street Lorry Park in eastern Freetown; Lumley Market, George Brook and Aberdeen Market in the west; and Model Junction, Ecowas Street and Congo Market in central Freetown. "The fact is that many have realized they can earn an income of their own without formal education and are unwilling to return to the drudgery of formal schooling for future use," she wrote. Although many skills training programs in Sierra Leone are now adding literacy and numeracy in order to enable beneficiaries to be adequately equipped for the industrial jobs that President Koroma projects in Port Loko, Pessima said bringing the beneficiaries from the streets and market places into centers to learn is a challenge. "Some find it difficult to attend full-time even though training will enable them either to perform better in their present occupation or to find better income-earning activities. The problem lies in giving part of their time to learning activities while being engaged in income generation,” she said. Evidence suggests states that increasing the level of education of their workforce see greater productivity, experts say. Overwhelmingly, high-wage countries have a well-educated workforce and productivity has grown more in economies with greater growth in the educational attainment of their workforce. In Port Loko, President Koroma expressed delight over what he referred to as the "unique standards" set by the founders of the All Peoples Congress party, standards he said he's determined to improve. The president, however, didn't say what those standards were. But let's assume the Attitudinal and Behavioral Change Secretariat in the Ministry of Information and Communication is promoting those standards of behavior in the public sphere as enunciated by the All Peoples Congress party. That those principles of public life include the people in our population who are needed in the workplace of tomorrow and who need education/training to take advantage of the opportunity it provides. That President Koroma's speech in Port Loko is all about increasing jobs for Sierra Leone's young population and will raise the rate at which all groups participate in the country’s economic life. Surely, the challenge then for the administration is to develop services that focus on each of these groups, their specific education/training needs, and their need for user friendly access, delivery, and support systems. And in 2014, the model is probably not by using an All Peoples Congress (APC) or Sierra Leone People’s Party strategy but stirring up pride in precious accomplishments. Like tolerance and cooperation that are proven assets in nation building, perhaps?